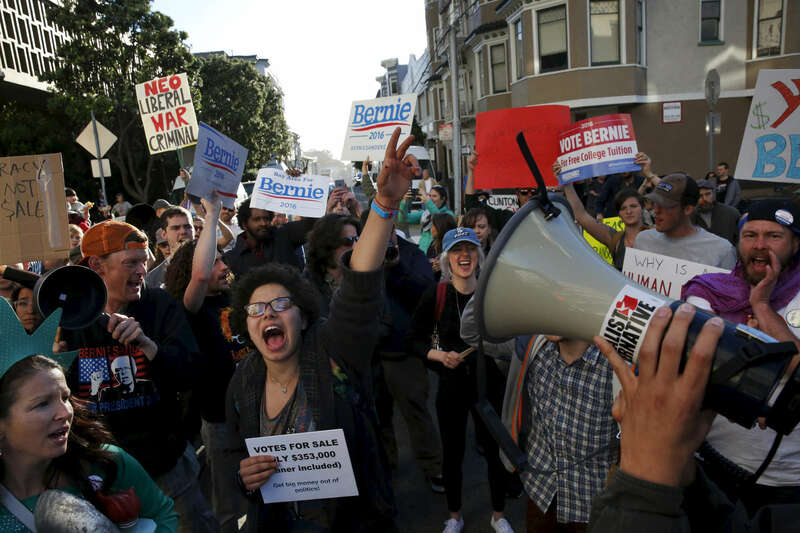 Ellie Koepplinger cheers with other Bernie Sanders supporters during a Hillary Clinton fundraising protest in Nob Hill April 15, 2016 in San Francisco, Calif. The fundraiser was attended by George Clooney, among others. Dozens of protesters showed up and marched around the block to each entrance where police had set up barricades.during a Hillary Clinton fundraising protest in Nob Hill April 15, 2016 in San Francisco, Calif. The fundraiser was attended by George Clooney, among others. Dozens of protesters showed up and marched around the block to each entrance where police had set up barricades.